In a world teeming with technological disruption and innovation, Uber stands tall among the globe's most mainstream names. 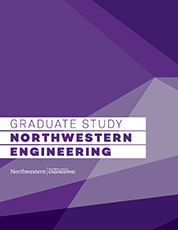 And thanks to a recent pilot course at Northwestern's Segal Design Institute, 11 Master of Science in Engineering Design Innovation (EDI) students gained a hands-on experience with the San Francisco-based enterprise's efforts to transform one of the nation's most critical industries. The elective combined coursework from EDI program director Jim Wicks' Management of Product Innovation curriculum with a human-centered design project for Uber Freight, Uber's "Uber for Trucking" business unit. The two-part course provided students a unique look at managing innovation, particularly in a fast-shifting industry greatly linked to the nation's economic vitality. "This was an opportunity for our students to work on design innovation within an industry undergoing dramatic transformation and to deepen their exposure to human-centered design under different circumstances," said EDI program studio director Amy O'Keefe, who sees the pilot course as a successful model for future curriculum iteration and industry engagement. Qing Qi, a global vice president of research and development at Mars, Inc. These guest speakers, provided insights on their respective companies and high-level project management while exposing students to broader aspects that impact design, such as a company's leadership, focus, tools and behaviors, brand clarity and vision, culture, and talent. "The speakers were really open and honest about what does and doesn't work and that allowed students to cut through the façade a company might have and get a sense of what leadership is really thinking about," Wicks said. Byron Pang (EDI '18) called the discussions "an amazing opportunity to learn about innovation and management" as well as the important concepts that spur the creation of more innovative products. In the second half of the course, students focused on design research and unlocking potential opportunities for Uber Freight, which continues expanding its services across the continental U.S. amid a competitive environment. Interviewing truckers, facility personnel, and Uber Freight account managers, shadowing at trucker facilities, and participating in industry forums, students identified pain points and potential enhancements that would improve the experience of truckers and personnel at freight facilities, effectively imagining a more seamless future for an industry long hampered by inefficiencies. "It was a sophisticated client experience that challenged us to identify problems and turn them into opportunities," Chris Datsikas (EDI '18) said. Datsikas and teammate SueSan Chen (EDI '18), for instance, investigated efficiency tools in shipping facilities, while the team of Anna O'Donnell, Ivan Calvachi, and Joshua Kim examined connections between warehouses and the technology innate to modern trucks, and discovered compelling opportunities around crowdsourcing. Pang and his teammate, Jasmine Kim (EDI '18), meanwhile, presented opportunity areas Uber Freight might explore with freight loaders and unloaders, an oft-overlooked cog in the efficient delivery of freight. "The most interesting part of this project was continually finding new stakeholders in the trucking industry and learning how greatly standards can vary from location to location," Pang said, adding that the industry's operational diversity demanded curiosity and an open mind. At the end of the term, students shared an array of ecology, journey, and opportunity maps with Uber Freight representatives. According to Uber Freight operations account manager Steve Sanburn, the company plans to investigate a number of the students' ideas. "It was interesting to see an outsider's take on our industry and the unique opportunities they see in an industry undergoing significant change," Sanburn said. 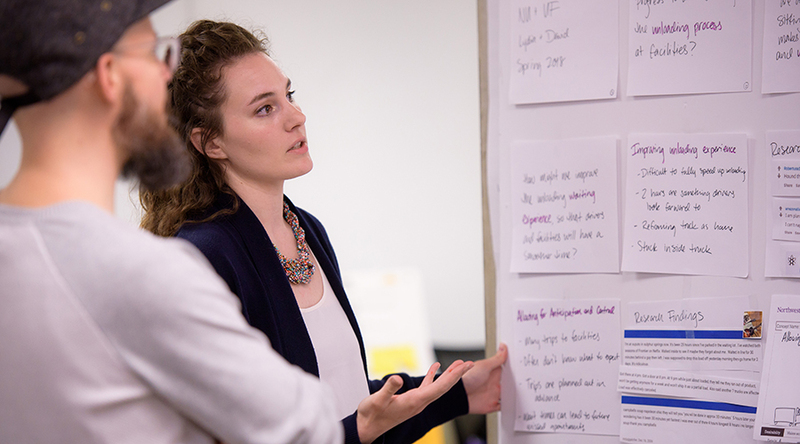 By merging discussions with the Uber Freight design sprint, Wicks found students were able to consider Uber Freight within the context of different models of innovation and accommodate elements such as corporate behavior and culture while developing promising solutions. "The students were able to make valuable connections between different stakeholders and pull out some high-level concepts," Wicks said. Combined with their technical skills, that type of analytical and critical thinking represents a unique hybrid valuable in today's business climate. The EDI students demonstrated their ability to identify unique crossover opportunities and relate them to a specific objective. "This project showed that our students can quickly enter an entirely new space and become acclimated very quickly to identify new opportunities," O'Keefe said. For Wicks, working alongside a dynamic company like Uber Freight and addressing gaps in a fast-changing industry also underscored design thinking's value. "As designers, students need to become comfortable with a high level of uncertainty," Wicks said. "It's different in every situation and it's important students explore design in a variety of circumstances."